Check out today's prep team spotlight on the 8-2 Captain Shreve Gators, which is a team that has a lot of momentum heading towards the end of the regular season! Check out today's prep team spotlight on the 5-3 Evangel Christian Academy Eagles, which is a team that is loaded with talent and is looking for another state championship title run at the end of the season! Last week, Louisiana Football Magazine's very own Lee Brecheen went on a trip to Shreveport to see some of the best teams the area has to offer. While visiting some of these elite programs in North Louisiana, Brecheen also got the chance to talk with some coaches and players on what is going on in the world of recruiting. Check out what he was able to find out over the weekend below. LAFM TV 13th Season! Episode 7! October 24, 2018	Comments Off on LAFM TV 13th Season! Episode 7! Check out today's prep team spotlight on the Live Oak Eagles, which is a team that is looking to build on their incredible 2017 season! Check out our Week 8 Recruiting Recap featuring Baker High School, Iota High School, Live Oak High School, and Terrebonne High School! LAFM TV Show! 13th Season! Episode 5 Now Available on YouTube! October 19, 2018	Comments Off on LAFM TV Show! 13th Season! Episode 5 Now Available on YouTube! 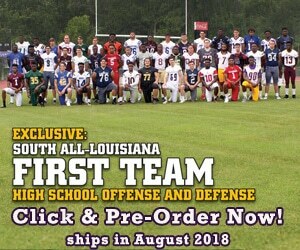 Check out today's prep team spotlight on the Terrebonne Tigers, which is a team that is dominating this season with a 7-0 record and has high expectations to compete for a state championship in a couple of weeks! Check out today's prep team spotlight on the Tara Trojans, which is a team that after a rough start to the season, is trying to piece things together in the heart of district play! Check out today's prep team spotlight on the Ferriday High School Trojans, which is a team that lost some talent coming off a Class 2A state title run in 2017, but still has the talent to make another state title run in 2018!